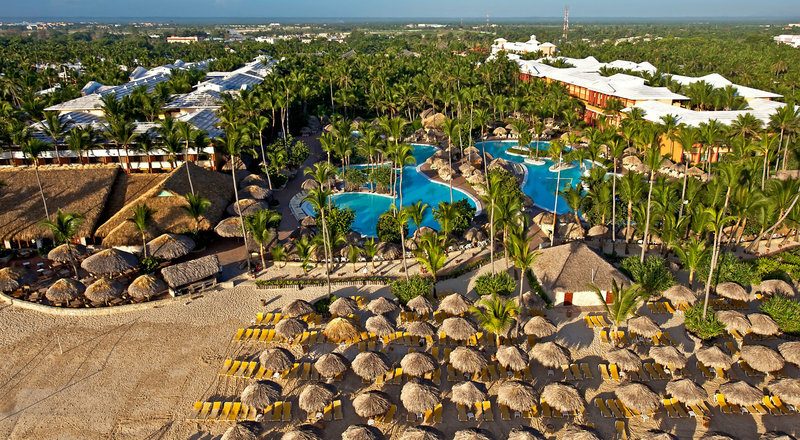 The IBEROSTAR Punta Cana is an all-inclusive, 5-star, newly renovated property located in the Dominican Republic. It won the 2013 Green Globe Award and is perfect for both couples and families. This property has something for everyone to ensure a fun, relaxing vacation for all. This resort has 427 guest rooms made up of many options. There are 334 standard rooms, 13 family sized rooms, and 80 suites available. Each room has a safe for valuables and a mini-bar. Room service is available and WiFi is free of charge in guest rooms and the lobby. Many food options are available at this resort. Choose from 6 specialty restaurants, 2 buffets, and 8 bars/lounges for great international dishes and drinks. The specialty restaurants available include Mexican, Asian (Thai, Chinese, & Japanese), Steakhouse, French, Seafood, and American. Many sport options are available for guests who want to keep fit or just have fun. Options such as golf, tennis, riflery, archery, soccer, volleyball, ping pong, petanque, horseshoes, and stretching are available. Water sports such as swimming, water polo, water volleyball, kayaking, snorkeling, canoeing, windsurfing, diving (PADI certification), and aqua aerobics are also available. Additionally, the property has gym and health club available to guests. There are many entertainment options available for both adults and children. Activity options for children including soccer, min-golf, tennis, kid’s club, face painting, teen’s club, Lucy’s club, crossbow shooting, ping pong, archery, water polo, pool games, films, beach games, and more. Adults can entertainment options include dance classes, step classes, Spanish lessons, theater performances, live music, and a visit to the casino. Additionally, there are entertainment options for families to enjoy together.